The relationship between the 2D and the 3D (between objects and their shadows). The relationship between materiality and immateriality. The relationship between different fields of knowledge, (e.g. art and science). Integrating art and craft into architecture. The impact of CAD/CAM technologies on art and craft practices. 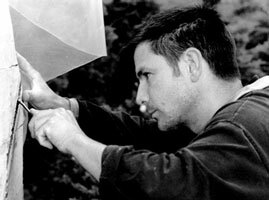 My personal practice is currently centred around using computer technologies in conjunction with decorative architectural plasterwork techniques to produce wall based artworks. By running 2D profiles through setting plaster 'extended forms' which seek to define both a process and period of time are created. I am keen to be involved in appropriate group shows and/or solo exhibitions, and to undertake commissioned work. Another avenue I wish to pursue is applying the running plaster processes developed to site specific installations where works are more integrated into the fabric of a space. The practice based research I have undertaken has been predominantly ceramic based and involved investigating a range of CAD/CAM technologies (i.e. computer aided design/computer aided manufacturing technologies) to aid the design and production of new works. My aim with these works is to extend the aesthetic possibilities within the field and develop working procedures which allow independent makers to exploit this new means of designing and making. I am always interested in hearing from people working in a similar area and in opportunities to undertake new research projects, whether this is within an educational or commercial context. In addition I am available for visiting lecturing, talks and presentations. I can be contacted through the contact page of this site.